After a highly successful first growing season, you would think it’s now time for the Bates garden, and the gardeners, to take a rest. 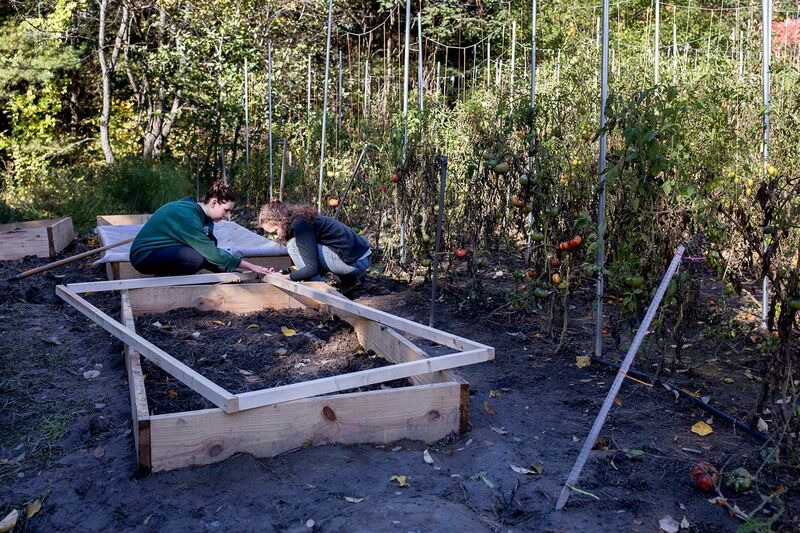 But in the garden on a windy, chilly mid-October morning, two Bates students and a staff member are preparing for a new round of crops instead. 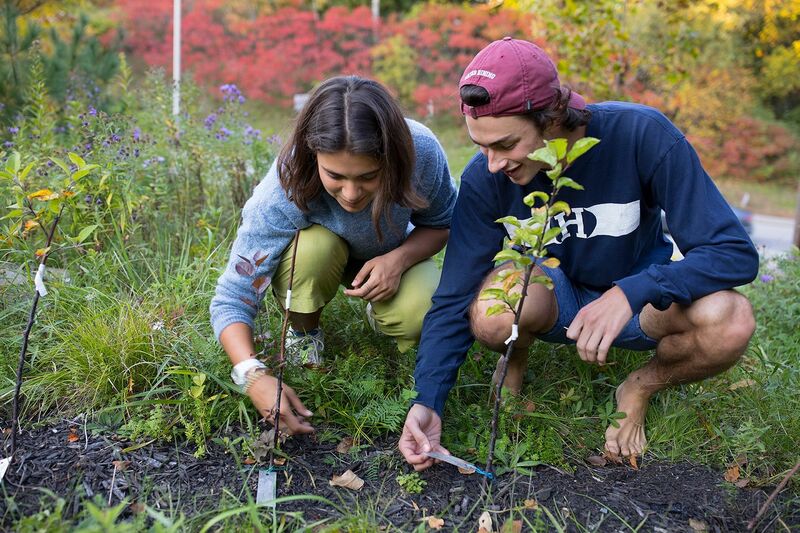 New plantings in Maine in October? You bet. Determined gardeners can extend the growing season well past summer with the right crops and the right infrastructure. And so on this morning eight trays of cold-hardy seedlings — carrots, leeks, arugula, spinach, beets, chard, kale — sit near the Bates trio in a patch of sun. In a patch of shade, the three are tackling the infrastructure: five big heavy wooden cold frames. Sustainability Manager Tom Twist is building covers for the frames from wood and heavy translucent fabric. 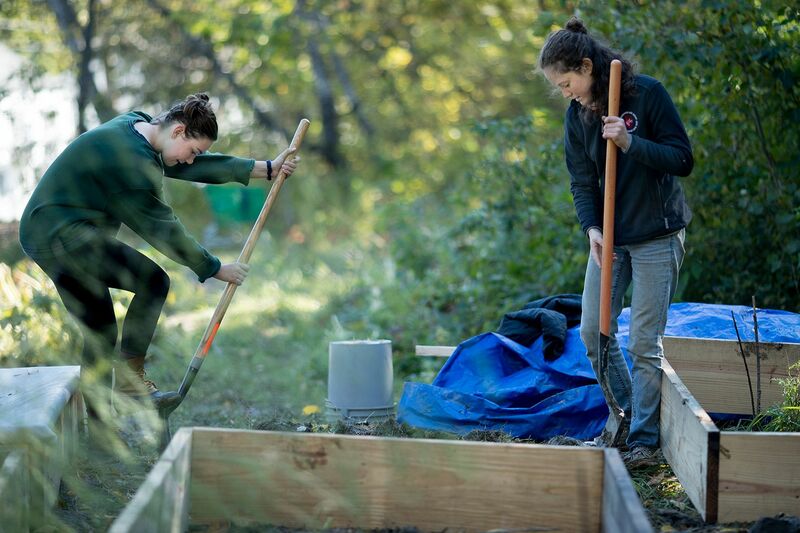 Meanwhile, aiming to settle the frames into the soil by a few inches, Katharine Gaillard ’19 of Boston and Olivia Kranefuss ’22 of Madison, N.J., are carving out frame-shaped trenches with long-handled spades. The soil in the garden, aka the Plot, is heavy and gummy with marine clay, and the digging is slow. Gaillard is making a bit more headway than Kranefuss. But she’s had a lot more practice than her first-year colleague. 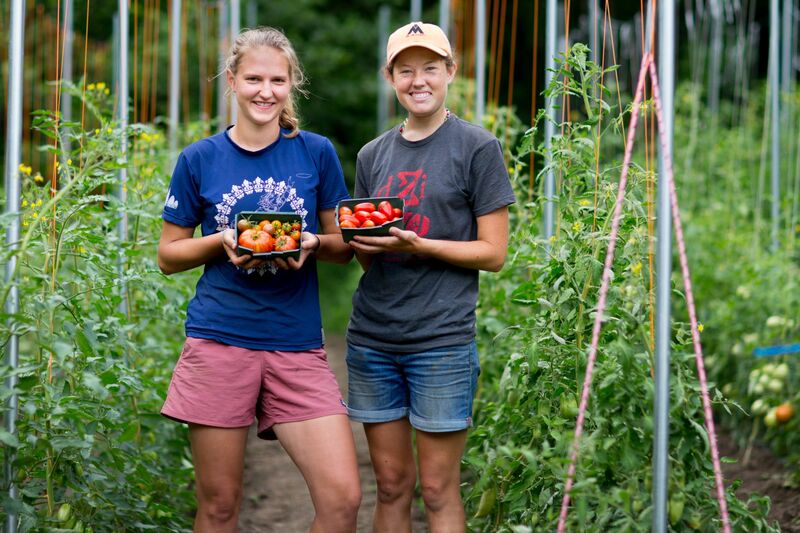 Gaillard and Josie Gillett ’19 of Seattle spent the summer at Bates as paid Plot interns — raising from that clay-heavy soil nearly a ton of produce that they delivered to Commons for campus consumption. *Juliet, a grape tomato, was the most productive variety by weight, at 170.4 pounds. The pair, in short, got the Plot off to a resounding start. The Plot’s first summer was a win for all concerned. Gaillard and Gillet gained valuable experience growing vegetables to customer specifications. Commons got fresh, Bates-grown produce to offer customers at the vegan station and salad bar. And diners were pleased to chow down on the tomatoes, cucumbers, kale, and other crops. Isa Moise ’19 of Mount Vernon, N.Y., heard about the Plot all summer — she was doing research for the project while she worked a summer job (aquaponic farming, in fact) — but didn’t get to work in the Bates garden until start of school in September. 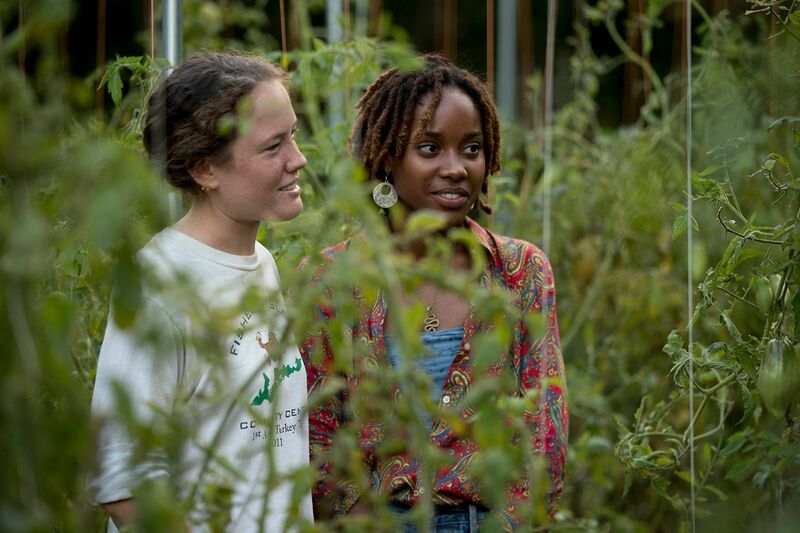 “Then, to see the greens and the tomatoes that we grew on people’s plates in Commons, that was just super cool.” Moise is co-leading the Plot with Gaillard this academic year (both are EcoReps, members of a student program undertaking campus sustainability projects). Aside from tending the new plantings in the cold frames, what remains to be done in the Plot after 2018’s productive summer is cleanup: removing dead plants and apparatus like the tomato trellises, and mulching the beds with dead leaves that Facility Services will supply. 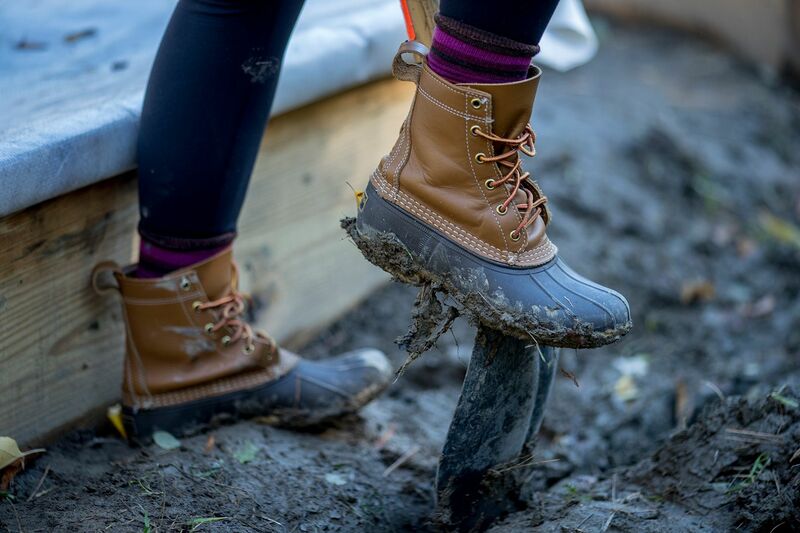 Those chores will be done during Bates’ Nov. 4 EcoService Day. As growers do, Moise and Gaillard are increasingly focusing on next year. One objective is to design a garden schedule, in light of this year’s experience, for their successors. Crop rotation, that tried-and-true means of keeping soil healthy with a minimum of fertilizer and other inputs, is part of the plan. 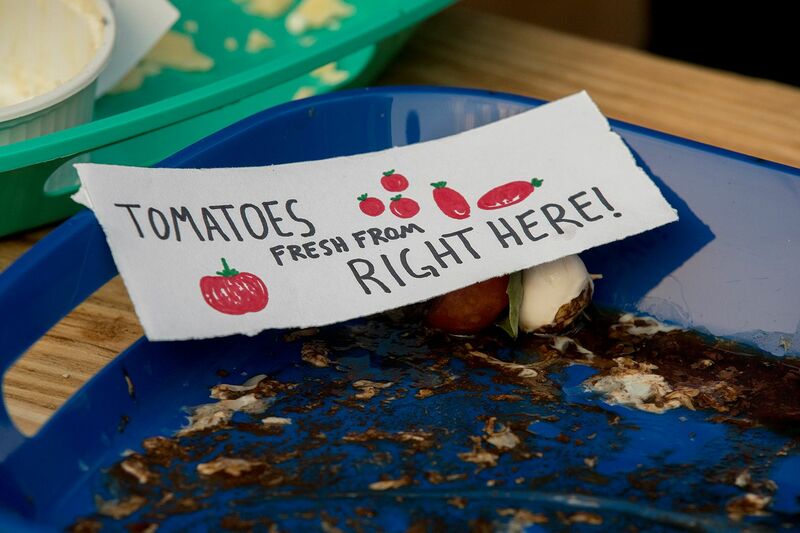 If Commons and its customers were pleased by the Black Cherry tomatoes and the Red Russian kale that poured out of the garden in July and August, the ultimate point of the Plot is teaching students. That entails all manner of practical skills (and not just wrangling clay soil), but a few deeper lessons have taken root in there, too. Rolling with circumstances is key, Gaillard agrees. And that encompasses the pleasures as well as the problems, a perspective that is valuable not only in the pressurized world of academics, but in the workaday world as well. Backed by Commons, the EcoReps, and sustainability manager Tom Twist, Moise and Gaillard are working a number of levers to enlarge the cadre of dedicated Plotters, which now stands at 10 or so. Regularly scheduled open garden hours make it easy to drop in and work for a couple of hours. The Bates Garden Club builds enthusiasm for the Plot through publicity and presentations on garden-related topics. On Oct. 9, the EcoReps event committee hosted a well-attended Garden Party. “That was awesome,” Gaillard says. And while they’re not complacent about attracting new recruits to the cause, she and Moise are nevertheless pleased by the excitement they’re seeing among fellow students.